If you’re unfamiliar with what many consider the worst Trek episode ever, allow me to educate you. It concerns a race of devolved super geniuses who steal Mr. Spock’s brain right out of his skull so they can use it as a living computer. The good news is, Vulcan physiology allows Spock’s body to run sans gray matter for a day or so. This gives Kirk and McCoy the time to go after those dirty, rotten scoundrels and retrieve the brain. The bad news is, once they have the thing, Dr. McCoy lacks the medical knowledge to hook it back up properly. He gets the speech center plumbing reattached, though, so Spock can talk him through the rest of the operation. You read that right. Mr. Spock tells Dr. McCoy how to reattach his brain. Yeah, it’s pretty silly. It’s also, by far, the most important thing I ever saw on television. The Big Idea, that thing that sci-fi in general and Trek in particular does so well, grabbed me and wouldn’t let go. A stolen brain running a computer. That same brain being hooked back up with the help of the man undergoing the surgery. I was hooked. From that moment on, I was a Star Trek fan. Fastforward quite a few years. I’m talking with a girl to which I’m extremely attracted. I’m sure it’s all physical, though. I suspect that we don’t have enough in common to build a relationship. Then, somehow, the subject of Star Trek comes up. Turns out, she’s a Trekker, too. We talk all night. I hate the term, “soulmate,” but she’s mine. It’s the most succinct way to describe our compatibility. Fastforward a few more years. That girl and I are happily married and living across the country. My Star Trek fandom led to a desire to make television myself. It’s a tough business to break into but, finally, my pursuit of a career as a screenwriter is bearing fruit. I’m on the set as the first episode of a television show I wrote is being shot. Where? Paramount, the studio at which Star Trek was made. 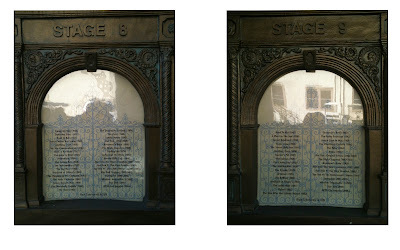 Then I look at the plaques outside the soundstages upon which I’m working. They list everything ever shot in these buildings. It turns out that Star Trek was filmed on the exact same stages. I take photos to email home to my perfect wife. It was a magical moment. I understand why people mock “Spock’s Brain.” At one point, McCoy is driving Spock’s de-brained body around like a remote control robot. Things get a little silly. I forgive you if you want to laugh at it or even call it the worst ever. But, when you watch episode 3.1 of the original series, do me the same courtesy. For just a minute, try to see it though my eyes. Take a moment to appreciate the mad and beautiful idea at its core. Something so strange and arresting that it could burn itself into my five year old mind and set off a chain reaction that continues to this day. “Spock’s Brain” didn’t just change my life, it made my life. hot dang, guest post! this is outstanding. kudos to both of you nerds. Great post, Scott and AshleyRose! Absolutely wonderful! And now, the kid in me who used to watch surgeries on the Discovery Channel wants to go watch this as soon as I get home from work. My favorite comment about "Spock's Brain" comes from "The Nitpicker's Guide to Original Trek," who notes that Spock undergoes major cranial surgery TWICE in this episode, but not one single hair is out of place -- do Vulcans have flip-top heads? Also, I think that it is very sweet (and perfectly understandable) that you refer to your "perfect wife." The thing is, *I* have the perfect wife! I'll have to check out "The Nitpicker's Guide to Original Trek." It sounds like fun!